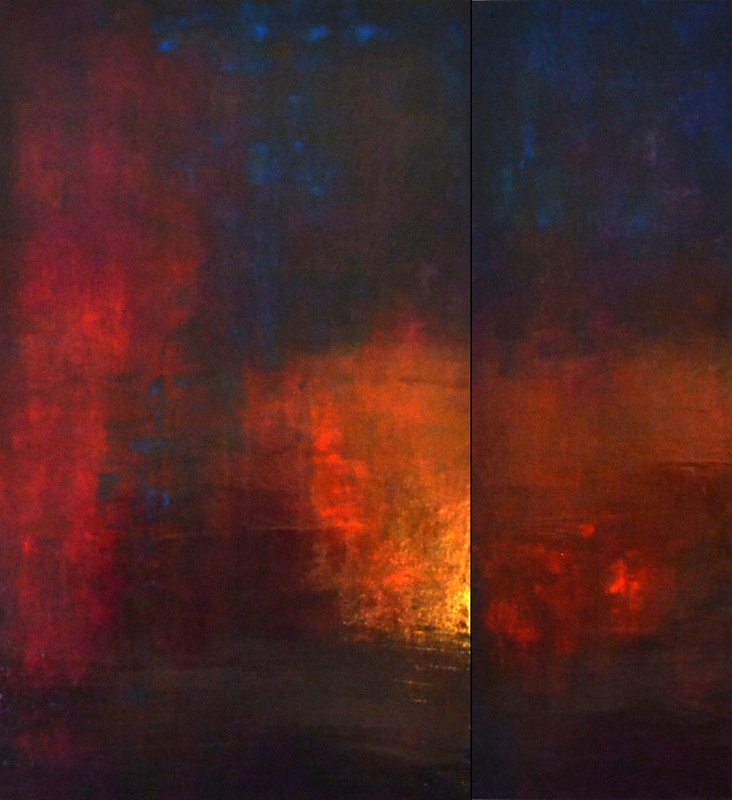 Ana Elisa Benavent’s large, brilliantly-colored abstracts compel the eye and convey strong, complex emotion. A solo of her work is on view at the Foundry Gallery in Dupont Circle until June 2. She recently sat down for an interview with fellow Foundry member Jay Peterzell. JP: You describe yourself as a color expressionist. 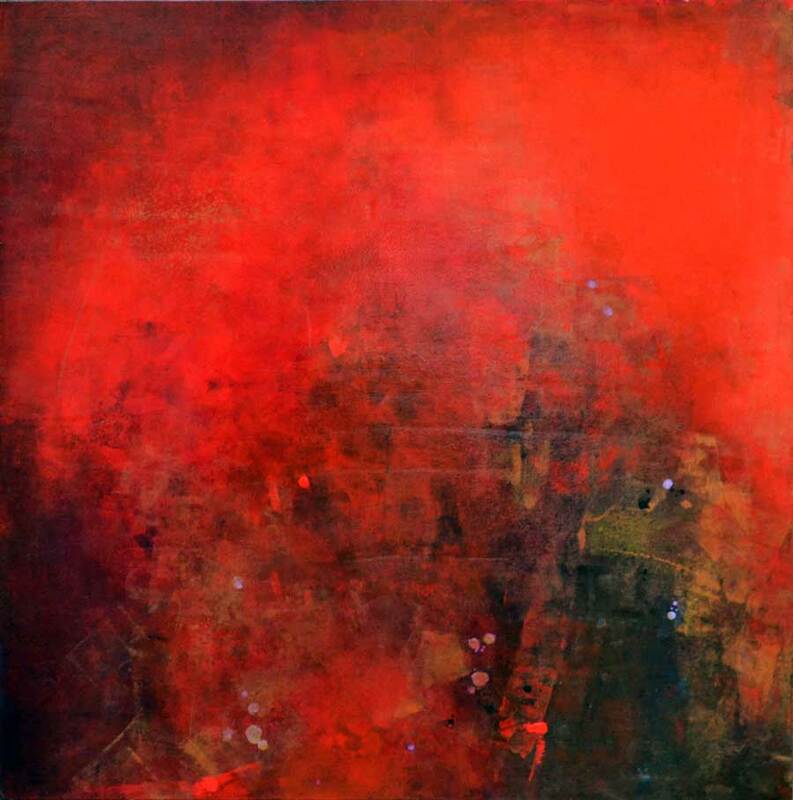 AE: I call myself that because I think in my work color supersedes forms and shapes and texture. That’s how I express myself, through color. And I am influenced when I say that by the color field abstract masters. Color is the foremost form of expression in my work and – I know it’s not an artistic movement per se, but that’s how I call it. JP: Well, it’s a take-off on “abstract expressionist.” It sounds like a silly question, but how does color express – in your work or in general? AE: I think that if anyone can get into my mind it would be kind of crazy and it just gets worse as time goes by – in the way color just has become a language of its own in my mind. I mean it’s like more and more I find myself just thinking in color. I know its very cliché to think, you know, red is energy and green is envy and blue is peace and things like that. But for me it goes a lot beyond that, it’s a way of really getting into my innermost feelings and emotions, the widest variety of emotions. And so I started trying to dig into the equivalent of emotions and feelings and colors. And the more I go into it, it kind of has gone the other way around, it’s kind of like the language of color is deeper than the emotion. So I start finding myself kind of looking at colors as a way of expression more and more. And so it’s going like a little bit crazy now (laughs) in my mind. JP: Looking at your paintings, I don’t feel any simple translatability into an emotion -- this is anger, this is whatever. You feel strong emotions in your paintings but you couldn’t quite put them in words. JP: That’s not that complex. AE: (laughs) I mean, it’s just not about being angry, it’s about all that entails. So, when a viewer asks me, what did you try to accomplish with that, I try not to give the whole story. And that’s part of my [artists’] statement – it’s my story, but it’s also your story. AE: That’s kind of what I wanted to convey. I obviously had a very clear emotion in mind when I painted it. But I don’t want the viewer to know the exact detail of it because I don’t want to tell the whole story. When someone looks at it I want them to form their own story about it. It’s called What You Keep to Yourself, well I want them to take a hint out of that, if they want to. If not, I want them to look at it and form their own story about it. JP: Well, “What You Keep to Yourself” suggests repression, and emotion being kept under the surface. JP: Would it be unfair to see a general theme of annoyance in your paintings? AE: Yes, it’s a coincidence of those two paintings. And I think this is not only about annoyance but also about a little bit of mystery. It’s not all negative I think. JP: But a sense of frustration at someone else’s lack of openness. AE: No, everything I paint is based on something that I feel. And I translate it into color the way I feel it. Whether the viewer sees it that way or not – it’s fun for me to see that. It’s almost a game, when I exhibit my work and see their reactions or interpretation of it – whether it’s similar to or different from what I felt when I painted it. But everything I paint is based on how I feel it. JP: Let’s talk about the technical aspect of what you’ve done here. AE: I always paint on boards instead of canvas. I think it reflects the color better than canvas, which absorbs the color. I start with a white gesso surface, and I do a lot of overlaying. I do layer over layer of color until I achieve what I want. So I do start with an idea – it never ends up being what I started with, but I do have the colors very much in mind when I start. JP: You know where you’re going. AE: Yes. I don’t sketch anything, I just have it in my mind and I start from there. I usually have a basic composition of colors when I start, like big fields, to guide me through the overall composition if I’m going to do thirds, or a Z, or just any basic artistic composition – and then I start playing around, and it becomes a moving target. At the end I may add a little bit, you know, like add an unexpected color. But that is just mostly from a composition standpoint, that’s not even emotional. JP: You start with emotion and gradually you’re gaining distance, you’re creating an object. JP: You grew up in Mexico. AE: Yes, in Mexico City. JP: What were your parents? AE: I really only lived with my mom, who was a journalist. We lived in Mexico City our whole life until I moved here 14 years ago. JP: Were you always interested in art? AE: I’ve always painted on the side, I just never had the time, I was raising kids, I was married, I was doing other things. I never really took it full time until my husband died four years ago. I started doing it almost as therapy. At the beginning I didn’t think of it as a second career, but it just started taking over. Before I’d never done abstracts. I’d done oil and figure painting and a lot of silk painting. But when I thought about taking painting back I wanted to do abstract because I thought it would be a lot more liberating and creative. I wanted the freedom that comes with abstract painting. JP: And you associate it with that period after your husband’s death. AE: That’s why I did the abstract work, because I was looking for healing. That was a period of healing in my life, so I wanted this to be part of it. JP: “Healing” is one of those words that’s used too easily sometimes. After someone dies like that there’s more than healing to be expressed. AE: Yeah. Yes. I also didn’t want my work to be – Well, and I didn’t start painting right after he died, I think I spent a year with Netflix (laughs) and then I started painting. But when I was ready to paint I didn’t want it to be about grieving and mourning, and darks and blacks, no, I didn’t want that. I wanted it to be more about how I was reinventing myself. You know, after the loss -- then what? Then I had to reinvent myself, and all this process that comes into finding yourself again and redefining what you’re going to be in life. So I didn’t want it to be this sad, dark – I didn’t want that, and I don’t think my paintings reflect that at all. I wanted it to be more of the process of empowerment and liberation and all those kind of things that would come in afterwards trying to go back into being this new person that I had to be. JP: You’ve talked about Rothko, his influence. Who else do you think about? AE: Well, one painter I’ve always admired is Van Gogh, just because of the bold use of color, which has nothing to do with my style. Rothko and Clyfford Still just attract me – and I wish I would one day be able to do paintings as large as they do because I think the large scale is so – is hypnotizing, the way it involves you. And that’s one of the things I like about painting large scale, you allow the color to involve you, you get immersed in it. And more and more I do larger paintings because of that. So that’s the beauty of the large colorful paintings. JP: Alexander Melamid, a Russian-American artist, talks about how confusing, or rather confused, art and the role of the artist are now. “There’s a crisis in art,” he says. “We believed ten years ago, twenty years ago, that we knew the secret. Now we have lost this belief. We are a minority with no power and no belief, no faith. I feel myself, as an artist and as a citizen, just totally obsolete... Okay, it can be done this way or that way or this way, or in splashes or smoothly, but why? What the hell is it about?” What is it about? AE: Well, I don’t think the role of the artist is obsolete, but I do think there is a bigger disconnection now between the viewer and the artist, and I don’t think that is a good place to be. I think the viewer and the artist need to be closer. When the viewer doesn’t understand the artist, that’s not a good place to be. And part of this confusion I think started when people discovered that shock and irony sells. A lot of things have been put into the mix of art that don’t really belong there. It’s perfectly okay to make art that’s ironic and shocking and that’s all good but when the main purpose of it is not artistic, when there’s no artistic value – whatever concept of aesthetics you have – then it belongs somewhere else. It may be a social manifestation, it may be a cultural manifestation, it may be crap. I think there’s a lot of confusion as to what really is art. So I think that’s where it is. JP: If you open up Art in America, there’s no painting in it. The only painting is in some of the ads. And yet a gallery like this one is mostly painting. Is it retro? Is it holding on to something emotionally satisfying or decorative that doesn’t have intense cultural significance anymore? AE: Exactly, you may argue that Abstract Expressionism was a movement of the ‘40s, the ‘50s, it’s seventy years old or sixty years old – what am I doing, you know? But I do think beauty, and artistic technical quality is still something that has value, that needs to stay there. I think there’s a lot of crap that will shed its way out eventually. Because right now it’s a novelty. And I want to think that the way I am doing this abstract expressionism is an evolution, not just a reiteration of what’s been done. JP: The challenge is to do something new that’s also still painting.